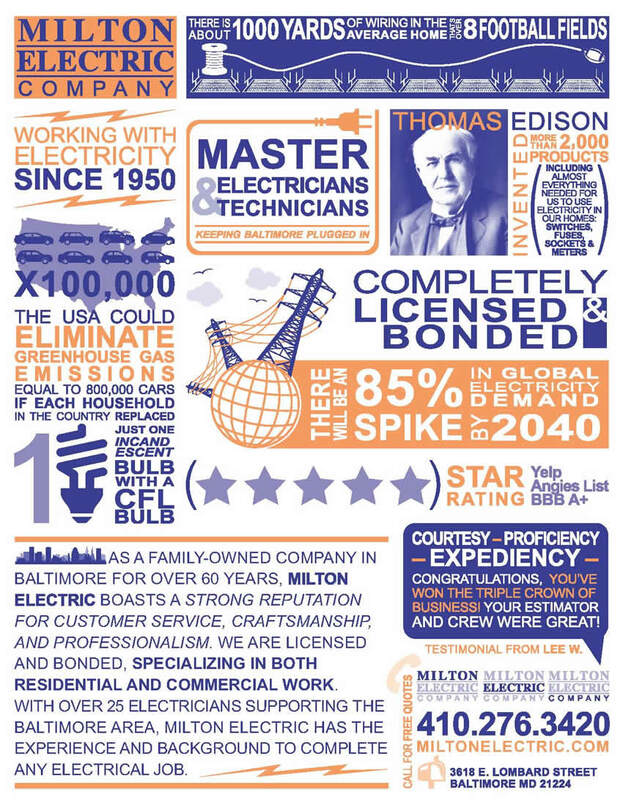 Milton Electric supports some of Baltimore’s best contractors in doing what they do best. COX Kitchens & Baths Inc. is the oldest kitchen and bath remodeler in the area, and has been family-owned and operated since day one. Their design team is made up of three certified kitchen designers that have a combined professional design experience exceeding 75 years. Binder Plumbing has provided plumbing, heating, gas, and drain repairs for the Baltimore area since 1982. Binder Plumbing works tirelessly to provide professional, efficient, and reliable plumbing services for Baltimore residents. Milton Electric is proud to be a certified provider for the BGE Smart Energy Savers Program®. Whether you’re a homeowner, business owner, or contractor, the BGE Smart Energy Savers Program® offers you a variety of powerful options to save energy, money and the environment. Southway Builders is a General Contractor servicing public, private and non-profit clients. Built on performance and accountability, the cornerstone of Southway’s success is uncompromised client service. Drawing over 75% of business from existing clients, Southway repeatedly delivers award-winning and successful historic restoration, commercial, institutional and residential projects. As part of their commitment, Southway is strongly rooted in a foundation of communities, both internally among its diverse staff as well as within the community in which it works. The Bozzuto Group, a privately held, integrated real estate services organization. Together we create quality homes and extraordinary communities-some 38,000 residences to date-while maintaining the utmost respect for the environment. We pride ourselves on providing outstanding service and consistent value for customers and partners. ServiceMaster by Singer – In addition to their main restoration services like fire, water, and storm damage restoration, they also offer special restoration services to recover sentimental or business critical items. They also provide remediation of health hazards like asbestos and radon. Zahlco Construction – A boutique construction and design firm, ZAHLCO leads the industry with its innovative philosophy where construction and design are not mutually exclusive. Zahlco has curated a highly sought-after in-house design team to handle every decision from doorknobs to layout so that you don’t have to. With a reputation grounded in reliability and integrity, Zahlco’s commitment to the client lasts from the first bid to the last piece of trim. They maintain a high-quality, service-oriented attitude that creates a sustainable competitive advantage for their clients and is why Zahlco has quickly become one of the premier construction and design firms in Baltimore. Evergreene Homes – Their “fit and finish” is what separates them from other builders. From ground breaking to finish, they pay attention to detail and diligently strive to deliver superior craftsmanship and construction standards that are rarely found from other home-building companies. The Stavrou Companies have developed, constructed and own more than 4,100 multi-family units throughout the mid-atlantic region totaling over $580 million in development and construction costs. As the developer, general contractor, and owner of each project, Stavrou has a vested interest in creating a quality product that will hold its long-term value and truly become an asset to the surrounding community. Horizon Services – When you need A/C, heating, or plumbing services, look no further than Horizon Services. For nearly 30 years, they’ve been the trusted name in plumbing, heating, and air conditioning, offering an unmatched level of service at reasonable rates. From Kent County to Northampton to Baltimore County and beyond, they proudly serve a large range of local homeowners with comprehensive A/C, heating, and plumbing services. Their expert technicians can carry out same day services and next day installations to ensure that your home remains comfortable year-round. Whether you’re dealing with a serious plumbing problem, a broken air conditioner, or a heating issue, you can rely on Horizon Services for the high-quality service you need at the price you want. C & H Restoration and Renovation specializes in the restoration and updating of historic homes. Located in the Station North Arts and Entertainment district in Baltimore, Maryland, C & H Restoration and Renovation is owned and operated by artists Nicholas Cairns and Timothy Horjus. Nick and Tim spent years working both as artists and in the trades prior to forming C & H in 2010. Renaissance Contractors is a full-service general contracting business in Lutherville, MD serving Baltimore and surrounding areas with a wide range of home improvement services. Founder Hunter Steadley has over 30 years of professional remodeling experience. From conception to design to build, their qualified team specializes in custom projects of all sizes. They will work with you from start to finish, ensuring your exact specifications are met. Elysian Energy is the region’s leading energy efficiency firm in DC, Baltimore and surrounding counties, providing high-value service to help you comfortably lower your energy bills and carbon footprint. Their carefully chosen team of experienced HERS Raters, BPI Building Analysts, LEED AP consultants, and Green Raters consistently provides a range of high-quality energy audits and other services to homeowners, building professionals, and government agencies.